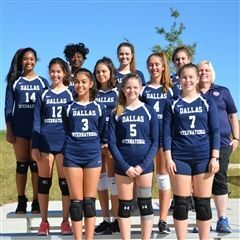 The DIS volleyball teams performed incredibly well in their inaugural seasons at both the middle and high school levels. Players and coaches alike gave it their all to begin what is sure to be a continuous run of success. With the playoffs squarely in their sights, the DIS volleyball teams are prepared to have their best season yet. The DIS high school volleyball team recently finished their first season together. They talked about the goals they accomplished, the lessons they learned and their plans for the future.